This past week, the White House and Vice President Cheney were subpoenaed by the Senate Judiciary Committee for documents relating to President Bush's warrentless wiretapping program (AP Article). The White House gave no indication it would comply with these subpoenas (CNN article), and the following day (Thursday), Bush refused previously issued subpoenas concerning the firing of the US Attorneys, claiming executive privilege (Yahoo! News article, Washington Post article). Is Speaker Palosi right? Is the act of impeachment only "worth it" if it succeeds? Should Cheney, Bush, and/or Gonzales be impeached? Have their actions called for it? What do you think? It's important to remember that impeachment is not removal from office, but the formal accusation of wrongdoing. Personally, I feel that impeachment is called for and should be seriously considered by Congress. ^ So I made your brain explode? *cough* So, anyway, Cheney, Bush, the White House, ect. were ordered to hand over information about illegally spying on American citizens (violating our Fourth Amendment). They didn't, claiming executive privilege. This didn't sit well with some, because executive privilege is usually used on the grounds that there is a need to protect military, diplomatic, or national security secrets, and what national security secrets could possibly be threatened by releasing information about an illegal act? By refusing to hand this information over, they could be considered in Contempt of Congress. Why didn't you say so in the first place. I think I saw this on the news. What do I think? Well can a president go to prison o :sleep: r has that ever happened in history? If so send him to jail I guess and bring back Clinton, the best president America ever had. Problem solved. A President has never gone to prison, but if put on trial in the Senate and convicted by a two-thirds majority, the defendant will be automatically removed from office. Afterwards, the Senate may vote to prevent the convicted of being elected or appointed to future federal office. If removed from office, the defendant may still face criminal prosecution, and if they leave office before impeachment is decided, they may still be impeached after leaving to disqualify them from future office or from earnings gained from thier prior office (pensions, for example). Isn't she African American? I think I've seen her before and I don't want her to be president. I'm not sexist, but the reason I don't want her to be president, is because she's a woman. lol sounds sexist, I know. This is Speaker Pelosi. 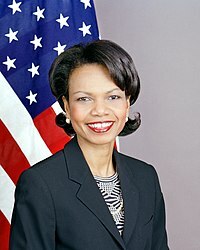 You may be thinking of Condoleezza Rice, the Secretary of State. Yeah, that does sound sexist. Y'know, the US may have a woman President following the 2008 election, if Senator Hillary Clinton wins the Democratic nomination and the election, but that's off topic. oh my bad,lol. Anyway I would love to debate about this but as you can see I'm lost when it comes to this stuff and I'm not American so........ yea. That doesn't sound sexist, that is sexist. ^ And I can't believe you replied just to comment about Doe's reply and to repeat that you're not sexist. Don't be a-spammin' my thread, please.